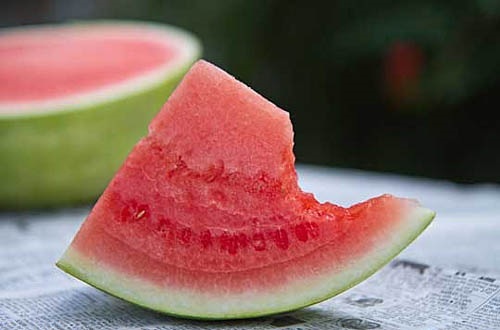 NEW YEAR’S RESOLUTION UPDATE: ON YOUR MARK, GET SET … - What About Watermelon? By now, you’re all well aware that my New Year’s resolution is to compete in a watermelon-eating contest. In last month’s update, I reviewed a few potential contests in my area and decided that the Bel Air 4th of July Festival in Bel Air, Maryland would be the event at which I would restart my once semi-successful competitive eating career. 1. SPEED – Competitors are given a predetermined number of food items (one dozen chicken wings, six cheeseburgers, half a watermelon) and the first person to finish all of his or her items is the winner. These contests are usually fast and can be over in as little as 30 seconds. 2. QUANTITY – Competitors are given a time limit (usually 8-12 minutes), and the person who eats the largest quantity of the contest food is the winner. These contests are grueling affairs, with many eaters pushing themselves to the limit during the final few minutes. It’s not pretty. My eyes have always been bigger than my stomach (which isn’t all that big), so speed contests definitely suit me better. From what I can tell, the Bel Air contest is a speed event. I don’t know for sure, but when you have events – like the Bel Air contest – with hundreds of competitors, giving each person a predetermined amount of food is usually the easiest and most cost-effective contest method. Although I haven’t been able to dig up many details about the Bel Air contest (I emailed the contest organizers and am awaiting their response), I was able to uncover the photos above, which were taken during the 2011 event. Curiously, it shows a hoard of competitors crouched down in the grass devouring a nice-sized chunk of melon. Based on those images, the contest appears to be a speed contest, which bodes well for me. Another good sign is a news article about the 2011 event that notes that the contest was judged by a local Girl Scout troop. I buy a lot of Girl Scout cookies (our local troop calls me “Mr. Ten Boxes of Tagalongs”), so I may have a bit of an advantage with those tough judges. Sure hope training goes well. Thanks Debi and Ellen! I’ll keep you posted!